This awesome feeding set has been great for my little girl. She was a picky eater, so we had a problem when we started feeding her solid food. We tried different approaches, but she just didn’t want to eat. We wanted to make her feeding time more fun, so we decided to buy a set of bright colors. And that was it! Our daughter just loved the cute graphics and the bright colors. We have used them for about a year now. I microwave food on them a lot and put them in the dishwasher all the time and they still look like new. The bowls are deep which helps as when she is eating things like yogurt or applesauce. It’s definitely worth the money (and it’s quite cheap!). The plates are large enough that you can fit an entire meal on them but small enough for your young child to hold and to use. 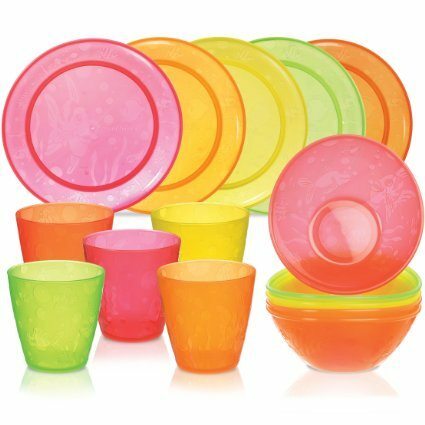 The bowls work perfect for pasta, chicken pots, fish and everything else, but they are also perfect for snacks. This feeding set has 15 parts and all the parts are really useful. Maybe a little bit too much for just one child, but we used everything. The only downside to this set that I can think of is that the cups are getting a little small for our daughter. Also, they don’t have a spill guard which was a problem when she just started using it. We also recommended this feeding set to our friends, and everyone was quite satisfied. That is why I decided to make a review, so that everyone who is looking for a perfect feeding set for their kids can know that this one is great. If you’re interested in other things we love, check out our reviews. *And just for full disclosure, there are affiliate links in this posts. That means that I’m sharing something that I think is helpful, and if you make a purchase through the link, I earn a little bit back. No extra cost to you, and just a little help for me to pay for the blog expenses.